As one of the world’s most recognizable and trusted brands, the Visa Gift Card is the perfect gift to give a friend or a loved one. With original photo and text, each gift card is personally designed for the recipient. You can add your own photo or select one of our custom designs to get started. Then customize the gift card further with a message embossed right on the card. You can also order a matching customized greeting card gift card holder using the same or a different image. Choose any dollar amount between $10-$500. Visa Gift Cards can be used online, over the phone and in your favorite stores and restaurants across the country—like Target, Walmart, Olive Garden and more. Basically, this card can be used in the U.S. wherever Visa is accepted*. So gift it with confidence! If you have received a Visa Gift Card from GiftCards.com, you can check your balance here Or you can call 1-877-944-3822 24 hours a day, 7 days a week to get your balance. Visa Gift Cards from other popular retailers are typically already automatically activated. If you purchased a Visa Gift Card from GiftCards.com, get your gift card activated by using our activate page. Or you can call the phone number on the back of the Visa Gift Card to activate. What is the GiftCards.com Visa gift card? The GiftCards.com Visa gift card is a “non-reloadable prepaid” card. Like a credit card, when you are ready to pay (or checkout online) use the Visa gift card like you would use any credit or debit card. Every time you make a purchase, that amount is automatically deducted from the card balance. Who can purchase Visa gift cards from GiftCards.com? Is a Visa gift card the same as a Visa credit card? A Visa credit card is different from a Visa gift card in that one is a credit card and one is not, but both are similar in that they can be used the same way. Learn More. Can I use my Visa gift card online? Absolutely. Visa gift cards can be used online the same way you would use a credit card. Simply enter your Visa gift card information at checkout. Can I let someone else use my Visa gift card? When does a Visa gift card expire? There is no expiration date for your Visa gift card. Is there a dollar limit on my Visa gift card? GiftCards.com Visa gift cards can be purchased in amounts ranging from $10 to $500. Who sells prepaid Visa Cards? We do! 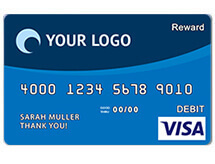 Prepaid Visa gift cards can be ordered and customized online at GiftCards.com. 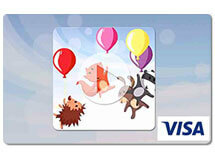 You can even purchase a Visa prepaid virtual card. Prepaid Visa cards can also be found in many popular retailers: grocery stores, gas stations, department stores, and more. Can I get cash off of my Visa gift card? The quick answer is probably not. Our very own Gift Card Girlfriend took a shot at answering this question. Read her answer by clicking here. What is a Visa Virtual Account? A Visa Virtual Account is delivered via email and delivery may take up to 24 business hours from the time of purchase. Can Visa Virtual Account be used in stores? Visa Virtual Account is only redeemable online and the balance of the card must cover the full amount of the transaction. Here’s a tip! If the Visa Virtual Account balance is less than the transaction total, then first use the Visa Virtual Account to buy an eGift card from the online merchant. When the merchant’s eGift card arrives, apply the merchant’s eGift card to your purchase and pay the remaining balance due with a debit or credit card. What’s the difference between a Visa gift card and a Visa Virtual Account? Both Visa gift cards and Visa Virtual Account are redeemable wherever Visa is accepted, however, Visa Virtual Account are only redeemable online and the balance of the Virtual Account must cover the full amount of the transaction. Visa gift cards are shipped via USPS or UPS, depending on the shipping method selected. Visa Virtual Account are delivered via email. How long does it take for my Visa gift card or Visa Virtual Account to be delivered? Orders placed weekdays between 8AM and 5PM EST are typically processed within 24 hours of receiving payment. Orders placed over the weekend may take an additional 48 to 72 hours to process. Once processed, Visa Virtual Account will be emailed immediately unless you selected a future delivery date. Please refer to our FAQ page for delivery estimates of physical Visa gift cards. What method of payment can I use to purchase Visa gift cards? GiftCards.com accepts Visa, Mastercard®, Discover®, and American Express® credit and debit cards registered to United States addresses. We don’t presently accept international orders. Are there any fees associated with Visa eGift cards? Where do you ship Visa gift cards? How can I place a corporate gift card order for Visa gift cards? You can place an order for Visa gift cards in bulk at OmniCard.com. How are Visa eGift cards delivered? Your recipient will receive an email message from GiftCards.com that contains a link to the Visa gift card. Please refer to the Activation page to redeem your gift card. If the gift card does not arrive within the expected time frame, contact Customer Service for assistance at 877-944-3822 or visit our Contact Us page. Please have the invoice number and the recipient’s email address available prior to making the call for fast assistance. How long does an Visa eGift card delivery take? It can sometimes take up to 24 business hours from the time of purchase to deliver the order unless you specify a future delivery date..
What is the shipping time for GiftCards.com’s Visa gift cards? *We cannot ship to P.O. boxes, only a physical address can be accepted. Unless a future delivery date is scheduled, on average, Visa eGift cards will be delivered within 24 business hours from the time of purchase. Business days are defined as Monday through Friday, excluding holidays. Additionally, we review all orders for potential credit card fraud. If we find irregularities with a purchase, the purchase may be delayed or you may receive an automated phone call to verify and confirm your order. We will NOT process or ship orders that require additional verification before confirmation is received by the credit card holder. How can I check the balance remaining on my Visa gift card? 1. Check your balance online here. 2. Call GiftCards.com Customer Support at (877) 944-3822. Can I reload a Visa gift card after I’ve spent the full value? No. Visa gift cards are not reloadable. Once the full amount of money is used on the card, it cannot be reloaded with funds. However, you should hold onto the card even after your balance has been exhausted, in case you decide to return items purchased with the Visa gift card..
Can I use a GiftCards.com Visa gift card to purchase my online order? Absolutely! Your Visa gift card may be used to make purchases online. Can I cancel my purchase of an Visa eGift card? What is Visa gift cards’ return policy and what are the product exceptions? Visa gift cards are not returnable and cannot be redeemed or exchanged for cash (unless required by law), check, credit, or payment on any credit or loan account deposits. How long should I keep my Visa gift card after using as tender for an online purchase? Are Visa eGift cards refundable? Once a an Visa eGift card has been e-mailed, it is non-refundable. If the intended recipient does not receive the e-card or accidentally deletes it, ask the recipient to check SPAM folders, deleted email folders or automatic filters. If the gift card is not found, contact Customer Service for assistance. Can I buy a Visa eGift card for myself? Currently, the only way is to have the eGift card sent to your own email address. When you receive the card, click the link to activate and claim the gift card. Upon activation, you should then be able to print a copy of the eGift . What exactly does the recipient receive when I send a Visa eGift card? On the delivery date you choose, an email is sent from GiftCards.com to the recipient informing them of your gift, with a link to retrieve it online. The link in the email goes to a page showing Visa eGift card you created, its value and eGift card number. This page also gives simple instructions for redeeming the eGift card. Can I buy Visa gift cards from GiftCards.com and have you send it to someone else? Yes! GiftCards.com can ship your Visa gift card to anyone with a valid street address within the United States or you can purchase an eGift card and have it emailed to your recipient. When is the Visa eGift card sent to the recipient? What do I need to include if giving a Visa gift card as a present? It is recommended (but not required) to pass along the terms as well as conditions and the receipt or proof of purchase with the Visa gift card. The activation information should already be included on the Visa gift card. The security of your personal information is important to us. We follow generally accepted standards to protect the personal information submitted to us, both during transmission and once it is received, including encrypting the transmission of any sensitive information, such as payment card information. If you have any questions about the security of your personal information, you can visit our Contact Us page. What should I do if my Visa gift card is lost or stolen? If your Visa gift card is lost or has been stolen, you should report your lost Visa gift card to the card issuer. If your Visa gift card was purchased from GiftCards.com, please </provide-feedback contact our Customer Support team> or call 1-877-944-3822 for more information on what to do next. What if someone makes a copy of my printed Visa eGift card? Why was my Visa gift card order canceled? For our GiftCards.com for Business Visa Reward cards, there is no service fee. However, the cards and any remaining balances do expire 12 months from purchase. 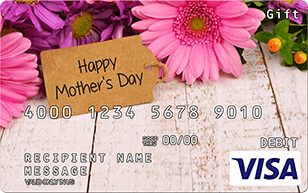 Visa Gift Cards can be purchased in various retail locations around the United States, but the only place to get a Visa Gift Card personalized is online. For a comprehensive list of retail locations where Visa Gift Cards can be purchased in person, click here. 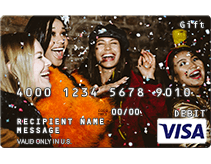 Hi, I’m Shelley Hunter, Gift Card Girlfriend here at Gift Cards.com, and here’s what I love the most about Visa gift cards—they can be used anywhere in the U.S. Visa debit cards are accepted—which to me, means pretty much everywhere. From little mom and pop restaurants to national retailers, if a Visa debit card is accepted, then the gift card will be too. Taking the time to make a personalized Visa gift card turns an ordinary gift card into a thoughtful gift. For example, if you’re buying a gift card for the coach, upload a picture of the entire team or just an action shot of his son swinging the bat. If you’re buying a gift card for your mom, choose a picture of the grandkids or get out the old photo albums and scan a photo of mom in her poodle skirt and beehive hairdo from the 50’s. If you’re ordering a gift card for a couple of newlyweds, select a picture from their wedding or a photo from when they first started dating. You get the picture. Be creative and think outside of the “gift card” box. Social media is a great place to find unique photos that you can turn into gift cards. People often post their selfies, pictures of recent accomplishments and throwback photos that would all make some pretty terrific gift cards. And 3, If you don’t have time to upload a photo, select from hundreds of our predesigned gift cards instead. Simply choose a design you like, add a custom embossed name and message and complete your order. If you need to send a gift card in a hurry, select a Visa Virtual Account instead. Your personalized image and video greeting can be sent immediately or scheduled for future delivery. I’m Shelley Hunter, Gift Card Girlfriend at GiftCards.com and those are just a few things you need to know about Visa gift cards. Visa Virtual Account can be ordered via GiftCards.com. Choose one of our custom designs or add your own photo to give it a personal touch. Visa Virtual Account may be used online in the U.S. and District of Columbia everywhere Visa Debit Cards are accepted*. Amazon gift cards can be used to buy anything on Amazon.com. While you cannot use your Amazon gift card outside of the Amazon website or mobile application, you can always choose a Visa Gift Card or Mastercard Gift Card, which can be used on any website or any brick and mortar store where Visa and Mastercard Debit Cards are accepted. *Debit Visa may not be used at any merchant, including Internet and mail or telephone order merchants, outside of the U.S. or the District of Columbia.